I guess I would probably recognize Hopkins from a photo, but I’m not sure I’ve ever seen him in anything…looking at the drawing again, I must again praise the eye though. I feel awful that I don’t see it! DANG! Sorry! I’m feeling like I see someone, just can’t pin it down. I’ll be thinking……. Don’t feel awful! Honestly, I’d be very stunned if anyone guessed it! Hub didn’t see it either. Actually, no one I showed either sketch to guessed it lol! Thanks, Johanna! Glad you enjoyed it! He has very penetrating eyes. British, eh? I might be in with a chance. It looks a little like Richard Wilson. Happy Hump Day to you too. Thanks, Michael! That was a good guess, indeed, my friend. They do look kind of similar, in the features we see here. I think in a few hours I will post the initial sketch of his whole head and see if anyone can see it, after seeing this partial one. The hardest face I’ve ever attempted, but love his eyes in particular. It was Anthony Hopkins, Michael. Wanted to let you know. A very challenging face! Thanks for playing! I really like the half face look, I think you have done a fab job, faces are so hard, especially when full of character, now my guess, is he in dr who? I’ve checked the cast list, old and new, and I’m not seeing his name. I’m really glad you like the sketch, Rebecca! You have stumped me Laura, he does look familiar. Your drawing today shows the aging face well, beautifully drawn. Happy Wednesday. Steven, thank you very much! As are yours, I might add!! Love your black cat. I’ve been drawing animal faces too and black fur is really tough but your photo of George was so nice and close and sharp, I may try it. Thanks again for your encouragement! Great drawing! I was going to guess Jon Voight, but he’s American (and he’s way north of 50s). Thank you so much! I hope you’ll stay tuned for the whole head later today. Still not sure if anyone will see him there, but I thought it might be interesting to see after this one. Thanks for stopping by and joining in! I showed my husband and he also guess Anthony Hopkins! You’ve obviously captured him quite well! The only actor I can think to guess is Geoffrey Palmer. Whoever it is, you sure captured a lot of personality in your drawing! Thanks, Laura! I’m glad you enjoyed it! I think I’ll post the full head (initial sketch) around noon my time. His face was tough but an interesting subject. I don’t know who he is. I think faces north of 50 are interesting to draw. Knowing how to indicate age takes a skill which you have! Thanks Carmel. Alphonso’s videos have helped me a lot! He is amazing! Thanks, Kirk! His is really a challenge. Glad you like it! I do recognize him but I don’t know his name. Off to google I go. I just can’t think what he has been in but recently he has definitrely played a bad guy. Definitely a villain, yes! Does the full face I just posted of him help? Although honestly, I still don’t see him myself. This was a tough one. Glad you enjoyed it! Well done Laura, such character. 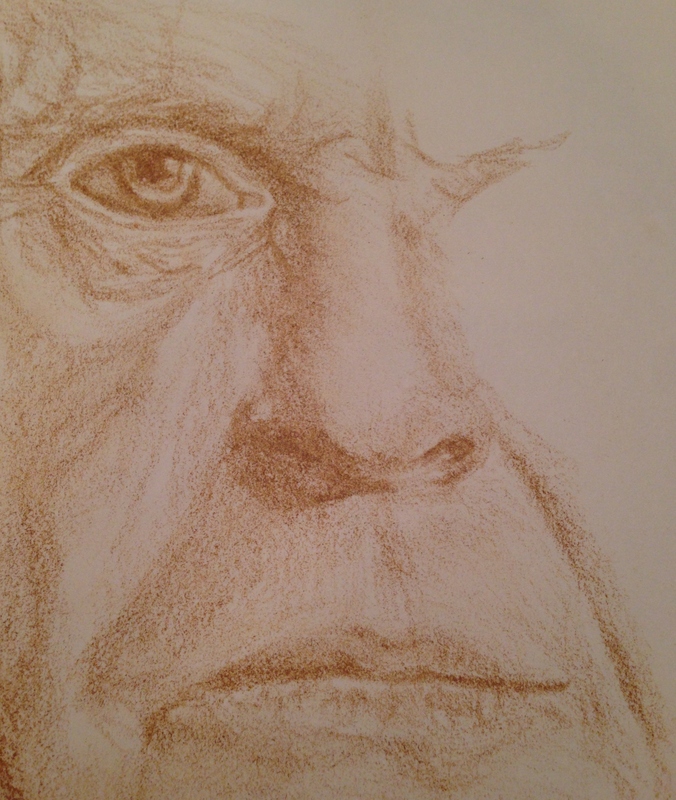 I will hazard a guess and say Anthony Hopkins. Thanks so much, Susan and you nailed it! Glad you stopped by! Thanks so much, Jill! Glad you like it! Thanks, Ann! You guessed correctly! Well done! I’m so glad you saw him! It was easy for you, but not many people guessed this! Charlie was the first! I don’t see him. Hehe. I do feel it’s kinda close but not sure how to make it just right. I’m so glad you like it! Niiiice! I guess this is the precursor to the one you posted today? I’m reading backwards in my Reader…LOL! Lol this was my second try of his face, but it’s the one I posted first, because I liked it better. I think not seeing the shape of his head made it much harder to guess so I went back to the first (full head) sketch and posted that this afternoon. I’m so glad you enjoyed it, Teresa! You nailed his intensity Laura – great eye too!